Maddow is holding on to her radio show for now, saying that if Bill O'Reilly and Sean Hannity can do it, why can't she? At the moment she's deciding how much of her audio self can be transferred to video. The radio show has the tightest format around. It begins with "news from Iraq and life during wartime," has several five-minute sermons on topics of the day, allows only two segments for interviews with newsmakers and journalists. As a break from the gargle of grim death, she answers nonpolitical questions from listeners ("Ask Dr. Maddow"). And toward the show's end she veers into the weird and wacky. For months she has monitored reports of severed feet washing up on the shores of the Pacific Northwest, and she's displayed nearly as magnificent an obsession with animal oddities as Stephen Colbert has with bears. Doing TV  first on CNN with Tucker Carlson, then exclusively on MSNBC  Maddow at first showed jitters. She didn't look comfortable with the ludicrous compression of arguments, the need to drown out other guests to get a point across. The casual-garbed Maddow also felt awkward having to "dress like a Senator" on TV. But as her radio work proved, Maddow's a quick study. She got on top of the medium quickly. Certainly the MSNBC brass thinks so. Otherwise they wouldn't have dumped Dan Abrams' The Verdict to make room for her. Maddow's patter naturally resonates most deeply with her fellow lefties. 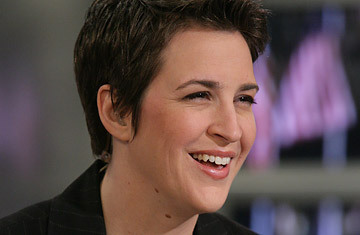 But just as liberals tuned in to Limbaugh for the sheer entertainment value of a great spieler reveling in his love of being on the radio, so conservatives can connect with Maddow's chipper intimacy, her skill at marshaling arguments without bullying the listener, her gift for sounding more or less middling to either side. Unlike many hosts on the radio and TV left and right, Maddow majors in common sense and shies away from conspiracy theories  though she did push the notion that Jeb Bush would be this year's GOP presidential candidate and, more plausibly, that if the Democrats couldn't agree on a candidate by mid-spring they'd be assuring four more years of a Republican in the White House. What she radiates  at least, what it sure sounds like  is an essential decency. Obviously there's an ego in there, but she seems genuinely modest (a rare attribute for a TV or radio host) and self-deprecating in a wry but not flagellating way. A self-proclaimed "civics geek," "policy wonk" and "prude," she will often dare to be square. On Wednesday's radio show Maddow acknowledged that whenever she hears The Star-Spangled Banner, "I immediately start to weep." Then she cut to a live feed of the convention's nominating roll call, and as New York State delegate Hillary Clinton proposed that Obama be declared the candidate then and there, Maddow blurted out, "I'm crying!" These days she can cry for joy. She's publicly lusted for a TV job for a year or two, and now she's got it. Her fans are happy too; in the peanut gallery behind the outdoor MSNBC convention post in Denver, some of them cheered whenever their gal got to speak. But the real reason to be pleased about her ascension is that it could offer an oasis of civility in the armed conflict of guys tearing one another apart. Maddow's emergence from the shadows suggests a beguiling option for cable-TV news talk: that nice is the new nasty.